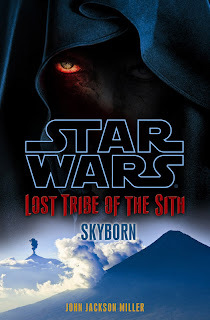 In August the free Suvudu library released the second free official Star Wars e-book entitled "Lost Tribe of the Sith: Skyborn" by John Jackson Miller. These stories tell the largely untold story of the Sith and are featured prominently in the Fate of the Jedi novel series. "A Jedi ambush leaves the Sith ship Omen marooned on a remote alien world, its survivors at the mercy of their desolate surroundings and facing almost certain death. But Sith will no more bow before the whims of fate than they will yield to the weapons of their enemies. And Omen's cunning commander Yaru Korsin will let nothing keep him and his crew from returning to the stars and rejoining the Sith order's conquest of the galaxy. Murdering his own brother has proven Korsin's ruthless resolve--but now an entire race stands in his way. The primitive, superstitious Keshiri worship unseen gods called the Skyborn, shun science, and punish unbelievers with death. Branded a heretic the widowed young geologist Adari Vaal is running for her life. Among the mysterious Sith castaways she finds powerful sanctuary--and her saviors find the means of survival. With Adari as their willing pawn, the Skyborn as their Trojan horse, and the awesome power of the dark side of the Force at their command, the lost tribe of the Omen set out to subjugate a planet and its people--and lay the foundation for a merciless new Sith nation." If you haven't read it yet download it HERE for FREE! Well worth the download! The third part in the series, "Lost Tribe of the Sith: Abyss", was released to the public on August 18th and I hope it is available for free via Suvudu in September! I'll definitely download that. I'm builing my collection of ebooks. thanks for the head's up.